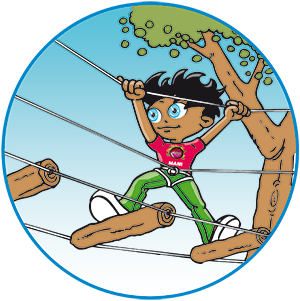 Our brand new adventure park up high is located in La Roche-en-Ardenne, in the province of Luxembourg. It’s a place to relax and enjoy pleasant moments with the family without “harming the environment.” You will come out of this experience in the trees a new person. Ardenne Adventures wants you to leave the routine and stress of your daily life behind when you come to this park. We propose a diversified offer of 50 workshops in harmony with nature. We also put in place dry toilets and degradable organic paper to reduce the impact on the environment. Finally, the park has a unique insurance system in Belgium, BORNACK (impossible to get loose), Europe safety Level E (maximum). Initiation course: Itinerary to initiate customers in the developments they will face during the course. This course consists of 4 workshops between 0.5 and 1 metre above ground. Course for 4-7 year old kids: Course for children aged 4 to 7, with a height between 1 and 1.5 m. The course consists of 12 workshops. The children are accompanied by their parents. Course for kids over 7: For children over 7 and for the entire family. This course consists of 16 workshops with a height between 2 and 5 metres above groundl. Red/athletic course: This course is appreciated by those who are more athletically inclined and in search of strong sensations. The course consists of 13 workshops accessible as of 9 years of age (or 1m30). The height is between 5 and 12 metres. Tyrolian course: The height is between 5 and 18 metres from the ground. The workshops are longer and higher. This course consists of 8 workshops, accessible as of 9 years of age (or 1m30). Quick Jump: This course consists of two workshops for a leap into a void 12 metres from the ground, for all people aged at least 9 (or 1m30). The 1st step consists of receiving and equipping customers for a period of five minutes. Each participant is equipped with a new generation harness. The 2nd step is the initiation course with the presentation of the safety rules by a qualified monitor. He advises, shows and then makes sure that everyone is able to do it. The 3rd step is the beginning of the activity itself. The duration varies depending on your level, and the number of courses.